10news.com – City of San Diego could install 250,000 smart water meters. SAN DIEGO (KGTV) – Every home in the city of San Diego could soon have a smart water meter, eliminating the human error that led to thousands of erroneous water bills reaching homes. On Monday, the San Diego City Council authorized up to $25 million to buy more than 250,000 smart water meters from company Itron Inc… Pub 3 Dec 2018 Added 4 Dec 2018. The County chose to adopt that new ordinance on October 31, in spite of protest from utility company Pacific Power that the County did not have the authority to intervene over fees that were approved throughout the state by the PUC. The ordinance is set to get into effect in roughly three months. SM00120 healingthebody.ca – Smart Meters causing tidal wave of mysterious illnesses..In recent years there have been increasing reports that “smart meters” – the digitized electric meters that are designed to send usage figures to power companies wirelessly – are causing a range of health issues among a growing portion of the population where such devices are in use. The electromagnetic fields (EMFs) emitted by these devices have been linked to a variety of health problems, including headaches, fatigue, digestive issues and sleeping problems. 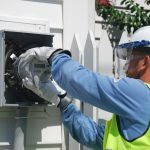 SM00107 utilitydrive.com Portland General Electric to develop ‘smart grids’ in 3 Oregon towns. Portland General Electric (PGE) unveiled on Thursday plans to build “smart grids” serving 20,000 people in three towns, scaling up clean energy technology more commonly seen in a microgrid in order to boost grid decarbonization efforts. SM00106 www.independent.com Montecito Water District to Replace Meters. SMU00101 abc11.com Eyewitness News Some Duke Energy customers claim smart meters are making them sick. Here’s how you can opt out. New options are now available for some Duke Energy customers who want to “opt out” of a controversial new technology. SMU00098 kqennewsradio.com Smart meters coming to county in November (2018). Pacific Power is bringing smart meters to residents and businesses in Douglas County. Pacific Power’s Regional Business Manager Scott Carter said the new technology will replace thousands of aging meters starting this fall. 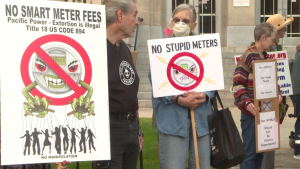 SMU00097 wlos.com News 13 Investigates: The health effects with ‘smart’ utility meters. SMU00095 KDRV.com Smart Meter workshop met with protesters. Hundreds of people came to Pacific Power’s Smart Meter Workshop in Grants Pass Saturday. 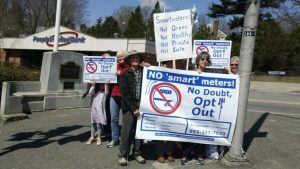 About 150 people with the group No Smart Meter were outside to protest against the smart meters and the opt-out fees. SMU00087 The Register-Guard.com Say ‘no’ to smart meters. So, EWEB plans to start rolling out smart meters in the fall. Letter: Wow! Really?!? This, even in the light of strong evidence that the microwave radiation they emit can cause significant health problems. No, there currently aren’t consistent findings of the adverse health effects. SMU00085 Tampa Electric rolls out smart meters for homes. Tampa Electric Co. is rolling out smart electric meters for its customers. In a statement released Monday, the Tampa utility described the meters as part of a smart energy grid that will “deliver safe, more reliable and affordable energy to more than 750,000 customers.” The project, which will cost $235 million, is expected to completed by 2022. “This new technology will ultimately connect our grid to streetlights, rooftop solar, electric vehicles and more,” Tampa Electric CEO Nancy Tower said. SMU00084 First of two smart meter workshops. MEDFORD, Ore. — Dozens gathered at the Jackson County Fairgrounds Saturday afternoon for a Pacific Power workshop on smart meter installations. Pacific power is hosting two smart meter workshops to help residents learn more about the new technology. Community members shared their opinions with Pacific Power representatives and were able to ask questions. SMU00083 Smart Meter Education Network – why 5G is a bad bet. John Dvorak, a columnist for PC Magazine, a leading computer magazine with which many of you are probably familiar, has come out with a strongly cautionary column, “The Problem with 5G.” He says, among other things….5G is “a bad bet because so little is known about the effects of millimeter waves (30GHz-300GHz). While these frequencies only permeate a small fraction of the human epidermis (the skin), the effect on the cornea, in particular, needs serious research. SMU00082 Lightreading.com Unicom, Telecom Merger: A 5G Bull in a China Shop. China may be on the verge of sacrificing competition on the altar of 5G. Seemingly terrified of falling behind the US in the race to build a next-generation mobile network, its authorities are reportedly poised to merge China Telecom and China Unicom to create a mobile giant with more than half a billion customers, according to a report this week from Bloomberg. SMU00081 Tech Tuesday: Facebook, Twitter To Face Senate and Smart Meters. Old electrical, gas, and water meters are being replaced by smart meters. They’re quicker than traditional meters, using radio frequency signals to send meter readings back to the service provider. While 132,000 meters have already been installed this year in Ohio alone, not everyone’s thrilled. Homeowners in Illinois have already taken the meter companies to court, preferring traditional meter options. SMU00077 fowardky.com PSC denies KU and LG&E bid to deploy smart meters. The Kentucky Public Service Commission has rejected a proposal by the Kentucky Utilities Co. (KU) and Louisville Gas & Electric. Co. (LG&E) to deploy advanced “smart” meters and associated technology throughout their systems. SMU00075 another aspect of the link below. A Federal Appeals Court in Illinois has ruled that “smart” meters facilitate government search – but called this practice “reasonable”. This story involves a collusion between big corporations, courts and a fake-grassroots organization. SMU00066 Cookcountyrecord.com Home energy use info gleaned from ‘smart meters’ is 4th Amend ‘search,’ but not ‘unreasonable’: Appeals panel. Noting their conclusions could change based on what other cities and utilities may choose to do with information gleaned from homeowners’ energy use, a panel of federal appeals court judges has found Naperville can continue collecting and storing electricity usage data transmitted directly by so-called “smart meters,” even though the data harvest essentially amounts to a governmental search under the Fourth Amendment. SMU00059 Dr Mercola – Inpower Must-see documentary reveals dangers of smart meters. SMU00056 WHO World Health Organization: Smart Meters are making people ill. Smart meters cause a “cornucopia of health issues” for occupants of the 57 million American homes equipped with the new technology, according to the World Health Organization and Cancer.org. SMU00043 Maryland Smart Meter Awareness – same site as below. Will probably bud off. SMU00039 Michigan – My Smart Meter does what? We think you should have a choice about something that so intimately affects your daily life. Because there are serious health and privacy concerns with “smart” or “advanced” utility meters, we are pressing for a new state law that would, like similar laws already passed in 14 states, protect our right to decide if we want to assume those risks. SMU00024 Healthy Home Economist – Harvard Doctor warns against Smart Meters. Dr. David Carpenter MD, a graduate of Harvard Medical School and a physician who has worked in the area of electromagnetic fields (EMFs) and public health for over 18 years, has a few choice words for power companies that are forcing smart meters down the throats of their customers all over the United States. Dr. Carpenter adamantly insists that there is no evidence whatsoever that smart meters are in any way safe for human beings. 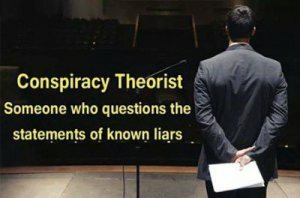 He goes on to say that there is, in fact, ample evidence that demonstrates “convincingly and consistently” that exposure to radiofrequency radiation (RFR) at elevated levels for long periods of time increases the risk of cancer, damages the nervous system, and adversely affects the reproductive organs.